Sergeant RAY GRAYSTON RAF Flight Engineer in Lancaster AJ-N – they breached the Eder Dam. Squadron Leader GEORGE JOHNSON DFM RAF Bomb Aimer on Lancaster AJ-T – they attacked the Sorpe Dam. Corporal KENNETH LUCAS RAF Ground crew technician who worked on the Dambuster Lancasters. Flight Sergeant GRANT McDONALD RCAF Rear Gunner in Lancaster AJ-F – they attacked the Sorpe Dam. 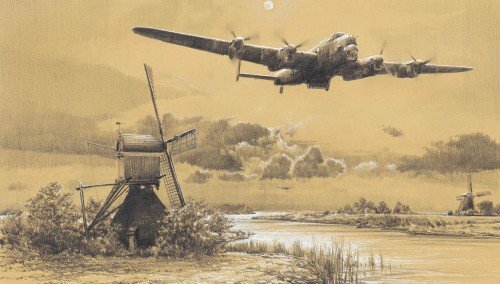 Squadron Leader LES MUNRO DSO DFC RNZAF Captain and pilot of Lancaster AJ-W, one of Gibson’s three flight commanders, assigned to attack the Sorpe Dam. Sergeant FRED SUTHERLAND RCAF Front Gunner in Lancaster AJ-N – they breached the Eder Dam.